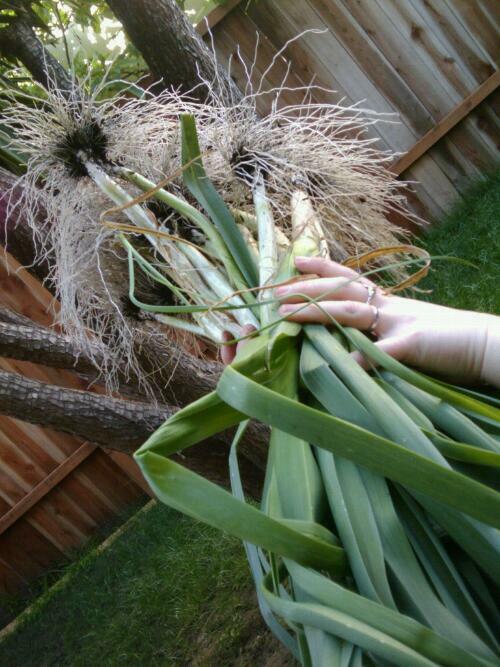 If you have leeks coming in for harvest, I made a tasty soup from those leeks I posted pictures of on Saturday. If you have leeks coming in for harvest, I made a tasty soup from those leeks I posted pictures of on Saturday. About two cups of leeks, chopped; 1/2 of one large onion. Saute in butter and olive oil (~3 Tbs) until soft and steamy, adding pinches of salt and fresh herbs to taste (rosemary, thyme, e.g.). Add one quart chicken stock, bring to a boil, and add 4 medium-sized potatoes, cut into bite-sized piece. Add a cup of water. Cover and simmer. Before serving, rinse well one can of white beans (e.g. great white northerns) and add to the pot. Once beans are warm, dish into bowls. Serve with a dollop of sour cream and fresh cracked pepper.